I've long been a fan of Laphroaig, yet I often take it for granted. In a bid to try every whisky under the sun, I sometimes forget to go back to what I know and love. I was fortunate that a very good friend of mine gifted me this bottle of Laphroaig 10 which he "tried to love, but just couldn't". He got it at Christmas 2016. I got it in August of this year. The bottle was more than 3/4 full when I got it. Adding water to Laphroaig 10 really pains me. It's just so perfect when sipped neat, that adding water seems criminal. Maybe not criminal, but uncivil. But I added water, you know, just to be thorough. With water, the nose shows much more fresh seaweed/iodine and vanilla. The smoke is pushed into the background. The palate becomes much more medicinal, developing some toffee, black coffee before finishing with sweet vanilla and cigar ash. With or without water, this is an absolute treat. I should note that the version of Laphroaig 10 in my cabinet is bottled at 43% ABV. Some expressions of this malt are bottled at 40% for some cruel yet unknown reason. I guess we're fortunate here in Ontario...despite paying much, much more for our whisky than other jurisdictions. I really should keep a bottle of this on hand at all times. @OdysseusUnbound I think all of North America gets the 43% version. I have had both the 40 and the 43 and there is a marked difference. We are fortunate indeed. Now if they would just give us the cask strength..... Cheers. 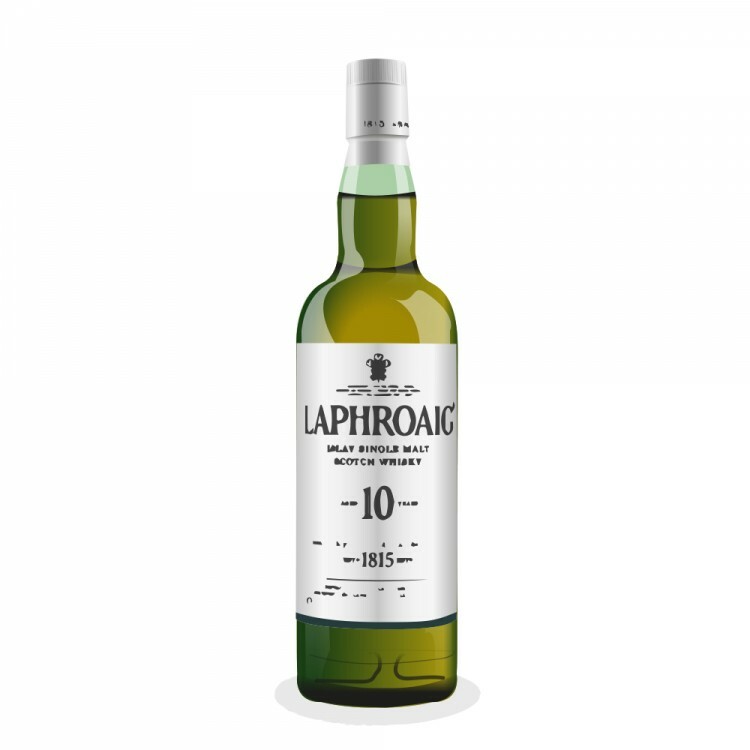 If and when the day comes that all North American 'standard' Laphroaig 10 yo is sold at 40% ABV, then there will be a lot of nostalgia for the 43% Laphroaig 10 yo. People will/would then say, "I wish I had stored away a few bottles at the 43% strength." Hopefully it will never come to that. The quality difference between the 10 and the 10 CS is so large, and the price difference is so small (in the US), that there's just no reason to even buy the standard 10 for home consumption. I only ever get it at bars. @OdysseusUnbound , guilty! Actually, I have been feeling like this topic is too readily spilling from my keyboard lately. I hereby impose a three-day ban on myself talking up Laphroaig 10 CS. I thought all those references were maybe Jackie Chiles from Seinfeld. @Nozinan, no, my open bottles are 1/2 bottle of the 43% 10 yo, and also 1/2 bottle of # 007 10 Cask Strength. My stored Laphroaig stocks are of 10 CS (4), Cairdeas (4), and 18 yo (1). If the Quarter Cask were about to go out of availability I would probably pick up 2 to 4 of those, too, post-haste. My current standard 10 yo is a very nice one to drink, but I do prefer the higher proofs. @Victor I predict I would agree with you. I've never had the 10. I would like to try it for reference but I don't think I need a whole bottle. I like the QC and if I can find it inexpensively in Calgary may replace the 1L bottle I'm working on. I have one CS open and one in reserve (that one thanks to you). And I have @paddockjudge to thank for each of my 2 Cairdeas 2015s, and for the sample so I haven't had to open one yet. @MadSingleMalt They may have been, originally. 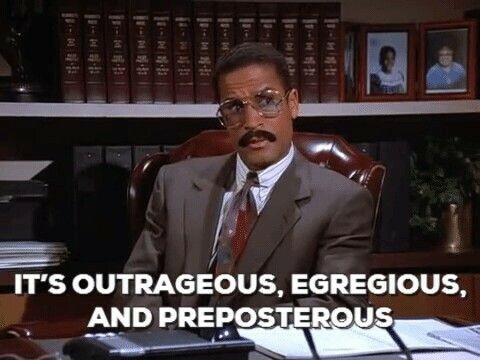 Key & Peele may have borrowed from the magnificent Mr Chiles. @Nozinan The QC is only about $0.80 cheaper than the 43% 10 YO these days. But despite the QC's higher proof, the 10 YO has a more pleasant, more balanced profile imho. @Nozinan Soon. My brother's having me over in September. We'll work it out for sure. ...@Nozinan, I forgot to mention that I also have bottles of Laphroaig 18 and 25 yo open. I forget about those sometimes because I've been trying to conserve them. @OdysseusUnbound I'm width you. 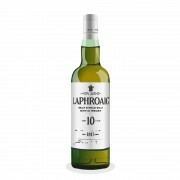 Even though the QC is the better ABV bang for buck, the entire Laphroaig DNA lives in the 10. Does anyone have an idea of what the minimum and maximum ages are in the QC? I know the quarter casks accelerate aging, but I wonder what they start with. Five to eight year old wo.uld be my guess. @Victor I think I tried some of that 25 when you visited. It was good. I regret that I have never tasted the 18. Actually I'm with you. Apple had other ideas. @BlueNote I believe their master distiller (John Campbell?) said in a video in the Laphroaig website that QC is 6-11 years old with the majority being 7-8 years old. It's really good, but the 10 is better, imho. @BlueNote In this video he says QC is 5-11 Years Old. I can't remember where I heard most of it is 7-8 Years, but I'll try to find it. @OdysseusUnbound , good bonus content on your blog, as always. Your transparent ploy to drive blog traffic from abbreviated Connosr reviews continues to succeed. That's the first time I've heard anyone talk about this: "Unlike the majority of distilleries, Laphroaig peats the malt before they dry it." Given that the point of peating is (ostensibly) to dry the malt, what's the story there? Other distilleries air-dry the malt first, but Laphroaig does it in reverse? And this would be only for their own floor-malted barley, while their stuff from Port Ellen presumably gets the standard air-then-peat routine? What's the source on this info? And I like this (rhetorical?) question: "Why do I need to try different whiskies when Laphroaig, Lagavulin and Ardbeg are all I really need?" My similar moment came at a midwinter whisky bash I held at my old house a few years ago. Everyone let me just run them through the battery of bottles I had lined up on the bar, ending with Amrut Fusion. And then, because the clock ticked past midnight and it became my 10-year anniversary at work (and because half the partygoers were work buddies), I cracked open a Laphroaig 10 CS from my stash to celebrate. It immediately outshone everything else we'd be tasting, and I dram-atically wondered aloud, "Why do I even drink anything else?!" " I regret that I have never tasted the 18." I can remedy that situation Saturday, around 11 p.m....after you've already tested FR Ltd Ed Small Batch Barrel Proof 125th Annivesary, Glenlivet Nadurra 16 YO 0712U, Bushmills 21, Macallan Cask Strength plus a few other odds 'n' ends. Laphroaig 18 awaits you. @paddockjudge Nothing not to love in that line. Keen to hear your thoughts on that batch of Nadurra and @Nozinan 's thoughts on the Laph 18, he's waited a long time. Not everybody is wowed by it, but it's one my all time favourites. Enjoy guys. ......and the allure of a drunk-dial to @Victor, some time after midnight, will have us howling like drunken frat brothers. @paddockjudge I might surprise you guys someday and show up to one of your little sessions. Actually, it doesn't sound like there's anything remotely little about them at all. I'm sure @Victor will be the voice of moderation, but as I recall, the drunken frat boy days were some of the best days. Now we're all grownups though, right? Right? @BlueNote Once we've moved I'll have a little basement suite just waiting for your visit. @MadSingleMalt The info about the peating is right from Laphroaig's website. I don't re-post that stuff here because I took for granted most people knew this stuff. But thanks for the kind words about my silly little blog. Please feel free to share/promote it incessantly. @paddockjudge He won't know what hit him... Lambertus anyone? Turv Exloo? @OdysseusUnbound Just checking out your blog, very nicely done. I thought I detected the presence of the great Kilgore Trout lurking there.